When you were too young, she sang you lullabies to put you to sleep. When you joined school first, she took time off her work to teach you rhymes. With Mother's Day nearing us again, TheHolidaySpot brings you a clutch of beautiful poems and poetries to let you relive your early childhood days and remember the love and care that your mom showered you with. 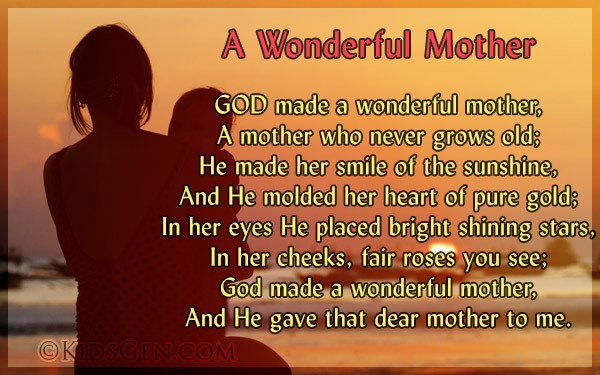 Go through these beautiful Mother's Day poems and celebrate Mothers Day. Happy Mother's Day! Hey kids! Check out these wonderful Mother's Day Poems and celebrate the occasion. Read these poems for your own enjoyment, or use them to create special greeting cards for mothers. He was feeding her cat. On a very fine goose.